WaterNSW Water Monitoring Programs describe the water quality and quantity monitoring undertaken to assist in efficient management of the state’s surface and groundwater resources to maximise reliability for users in an efficient, effective, safe and financially responsible manner. To monitor these resources, we require large amounts of information and data. WaterNSW operates a wide range of water monitoring programs measuring surface water level and flow, groundwater levels and storage levels and volumes, this includes monitoring for chemical and biological parameters. 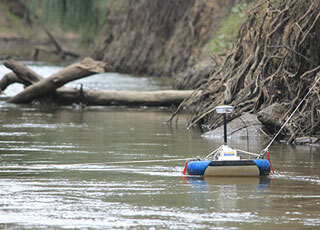 The monitoring involves a combination of automatic digital sensors and logging devices as well as manual sampling and analysis. Data is then collated within a central database system. The time series water information at a typical monitoring site is measured every 15 minutes with data generally being imported at hourly intervals to a central location for processing, archival and dissemination. Design of the Water Monitoring Program is based on operational and regulatory drivers and designed in consultation and collaboration with customers and stakeholders. Monitoring requirements are determined based on risk assessment or as required for operational purpose, management of incidents, investigation of emerging issues or for research to improve knowledge about the water supply system. 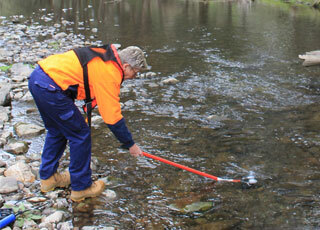 WaterNSW undertakes water monitoring on behalf of government and private customers. Over 5,000 monitoring stations measure the quality and quantity of water in our rivers, streams, groundwater bores and dams across New South Wales. Over 1300 of these stations continuously monitor water sources delivering real-time data through our telemetry and remote data capture networks. A number of circumstances may delay the delivery of data from the monitoring sites, which can include telecommunication issues, instrument malfunction or local site conditions. Manually collected data readings can be taken at intervals from daily to annually in accordance with the various monitoring programs. Please note all real-time data is collected and displayed to Eastern Standard Time (UTC+10) at all times during the year. In the interest of making data available as quickly as possible, the data is provided largely "as-is", i.e. it has come directly from the automatic devices that have recorded it. While data collection activities are quality assured, the data delivery time constraints mean that little or no validation of the data can be carried out before the data is made available through this web site. Quality assured data is available for download through this website up to 90 days after collection. If you have any issues with the data or the web site please contact us through the customer contact centre.